Our area includes more than two dozen communities just west of the Twin Cities metro area in Carver, Wright, McLeod, western Hennepin, and eastern Meeker Counties. 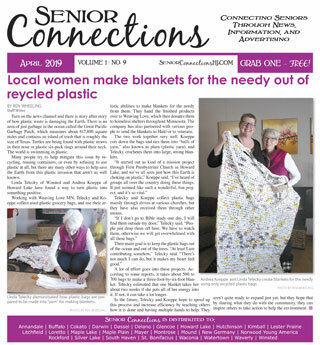 Look for Senior Connections available FREE on news racks in your community, or you can always see the current (and past) issues here. Senior Connections is published just before the beginning of each month. To be notified by email when a new edition is out, enter your email address in the form at the top of this page! And if you have anything to share with readers of Senior Connections – a story idea, an article for consideration to be published, an event relevant for our readers, or even a recipe, joke, or poem – just drop us a line with this form. Of course, advertising is the bread and butter for all media. To reach our readership with your product, service, or event message, just contact us here. Thanks for checking our Senior Connections, and please mention us to anyone else who you think might find our content interesting. Copyright © 2019 Senior Connections – Herald Journal Publishing – Winsted, MN. All Rights Reserved. Be notified when the next issue is published!